The Teeth In One Day treatment is a revolution in the world of dental implants. It provides you with a full arch of teeth with just four implants, making it the most non-invasive treatment available of its kind. Implants are attached to the anterior maxilla, allowing the bone to fuse effectively with them. This gives a strong structure to your jaw and allows for replacement teeth to be placed on a bridge. The result for you is new fixed teeth that look and feel natural. The ingenuity of the Teeth In One Day treatment comes largely from its engineering principles, which are very simple ideas that provide effective solutions and enhancements to the usual dental implant surgery. 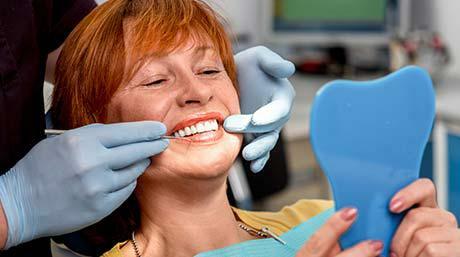 One of the most important phases of the Teeth In One Day treatment is the design phase. It is during this time that specialists, dentists, and prosthodontists all cooperate to make sure your dental implants are going to work for you. The implants are designed to fit your mouth and to be set into strong bone, while avoiding any weak or vulnerable spots. The overall design will allow for the bridge structure and replacement teeth to sit perfectly and so it is crucial that everything is up to par. Although not strictly an engineering principle of the Teeth In One Day, the technology used during the design phase paves the way for the use of the simple but effective solution to be installed. CT scans are used during the initial dental examination. They emit a very low frequency of radiation, while giving a clear and accurate 3D image of your jaw, gum, and tooth structures. This is combined with 3D diagnostic and treatment software, which identifies the best course of action for the implant surgery, unique and personal to you. The Design phase takes incredible skill and is enhanced by the ability of the professionals involved in the process, but the engineering of the Teeth In One Day solution itself is quite the marvel. Tiny adjustments and handy designs feed in to an incredibly effective solution. Many of these engineering principles are patented and cannot be found anywhere else, at least not to the same level of success. Dental implants become stable in a process known as osseointegration. This is where bone fuses with the titanium of the implants, making them a part of your mouth, giving support to your jaw, and allowing for the best possible functionality of your replacement teeth. Osseointegration is the single most important factor that affects the success rate of a dental implant treatment. If the implant fuses, then there isn’t likely to be a problem. As well as the angles of the abutments and implants, the implants themselves help to encourage the process. They have a special TiUnite surface, which is coated with extra layers of titanium, as well as patented grooves which increase the surface area of the implant, which helps it to fuse. This provides enough initial stability to accommodate ‘Teeth in One Day’. Implants and abutments don’t always provide enough structure to support replacement teeth immediately. This can leave patients without teeth for several months as they wait for implants to heal after surgery. This is not the case with Teeth In One Day implants, which provide enough structure to allow the prosthodontist to install a set of fixed replacement teeth on the same day of surgery. This provides an immediate solution for edentulous patients. It may sound trivial, but the Teeth In One Day abutments come with a unique and patented handle, which replaces the tweezers that are usually used in practice. This handle grips the abutments perfectly, allowing the prosthodontist to hold, place, secure, and adjust the fitting at well, and with great ease. This makes for a more accurate and pleasant experience, and for higher rates of success in surgery. The handles can even be used to check the angle once the abutment has been placed. The Teeth In One Day treatment is one of the most innovative dental implant solutions available and it all came about through relatively simple design and engineering principles, along with the latest technology that was used to make them. For the patient and the practitioner, these engineering principles mean a great deal in terms of ease, accuracy, and comfort. For the patient they also offer a new and improved life, with stunning replacement teeth that are designed and built to last a lifetime. The treatment is made as non-invasive and as time and cost effective as possible by the engineering. For the first time ever a full arch of teeth can be installed with just four implants! No bone grafting is required in patients with weak jaws, opening up the accessibility of dental implant surgery to many who otherwise wouldn’t have been able to have it. Put simply, the engineering principles of the Teeth In One Day might be simple, but they have changed the dental implant industry forever, and they have changed lives for the better. Is Teeth In One Day For Me? The Teeth In One Day treatment is highly effective for edentulous or partially edentulous patients, and is useful for anyone who wants a full lower set of replacement teeth, a full upper set, or both. The success rate is extremely high, and the treatment suitable for most patients, even those with weak bone structures. Your dentist or prosthodontist can help you to understand more about these options, and how they apply to you. Following their advice, along with your own feelings, you can decide on the best course of action to grant yourself the gift of new teeth. At Friedman Dental Group we offer both dentures and dental implants, and can help you to know which is best with a free consultation. Contact us today if you are suffering from losing teeth, and want to know more.